It demolished the 'ring - will it leave Silverstone standing? Were there a Panini sticker album for AMGs, PH's would have been missing that elusive star striker - the GT R. Suffice it to say we were keen, especially after seeing THAT 7min 11sec 'ring lap in the hands of Sport Auto loon Christian Gebhardt. Quick re-cap though. 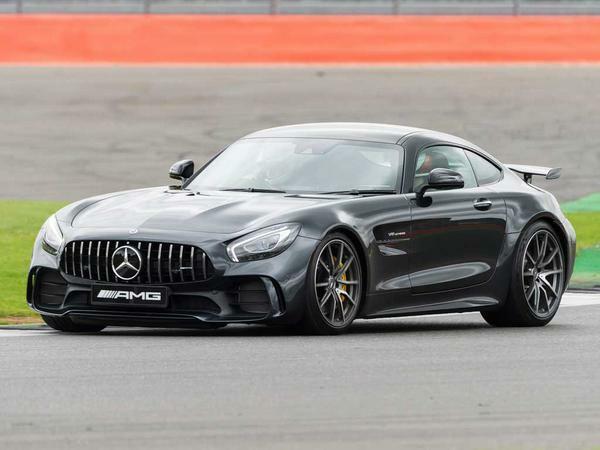 After a shake-out the GT range now comprises the uprated GT, 522hp GT S, GT C with 557hp, wider body and four-wheel steering and, at the top, the 585hp GT R, with the same plus active aero. There's now a Roadster too of course, currently limited to base GT and GT C trim, but likely to gain an S version in due course. All GTs now feature the GT3 racer's 'Panamericana' front end with Active Air Control variable slats. Given its growing remit, 911 comparisons are inevitable; the GT R's price and circuit ambitions inevitably pitching it against the GT3 RS. On paper you wouldn't give a front-engined, 1,630kg AMG much hope against a highly evolved Motorsport 911 weighing at least 130kg less. 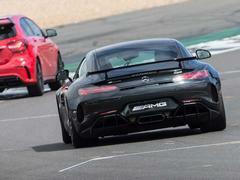 Courtesy of that 'ring lap the GT R rather proves itself a contender though. To the point where we bumped into Walter Rohrl having a good nose round a GT R parked up at the Goodwood unveiling for the GT2 RS. "It's an interesting car," he said, guardedly. If you see this coming, then move. Quick. Our Walter's not wrong either. Because the transformation from GT to track slayer takes more than a fixed rear wing, noisy exhaust and lick of AMG Green Hell Magno paint. That wing, the widebody stance, the extra vents and the prominent diffuser at the back are obvious enough, but the really clever stuff is out of view. Can you feel the benefit? One key feature is the race-inspired nine-stage traction control system, temptingly presented as a prominent yellow dial in the centre of the dash. You know, the kind that just begs to be twiddled... ESP Off in the R uses the same calibration as the GT3 car, the traction control just that and letting you dial in the appropriate level of intervention. '1' is for wet and greasy conditions, '9' for heroes. Theory being you select the loosest setting you can get away with and then floor it with confidence, the system holding maximum power against available traction. Our chaperone politely but firmly insists everything stays on though, perhaps not unreasonably. For now Race mode is out of bounds too, given it adopts the looser ESP Sport setting. You've seen the green - now it's time for black! This is a shame because Race also engages the R's party piece active aero. Above 50mph a flap lowers beneath the front bumper, reducing front axle lift to improve turn-in and steering response at track speeds. Air from the radiator is also extracted under the body and through the rear diffuser to help cooling and maintain the aero balance, while you can play with the rear wing angle and spring preload via manual adjustments. 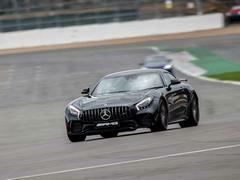 This official AMG video explains more, the vertical shutters of the Active Air Control remaining closed for improved drag and downforce unless additional cooling air is required. Overall downforce at top speed is increased by 155kg over a regular GT while drag is actually reduced - no mean achievement. 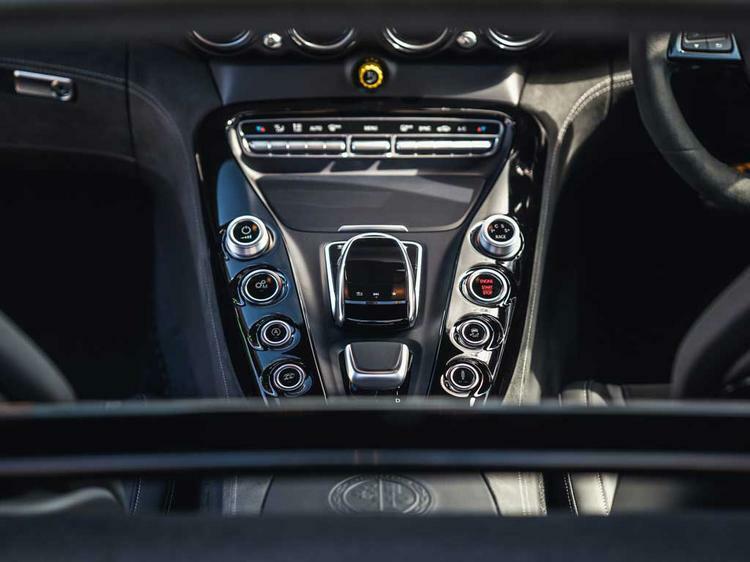 Even 'just' in Sport Plus mode you can feel the intent through every interaction with the R's controls. 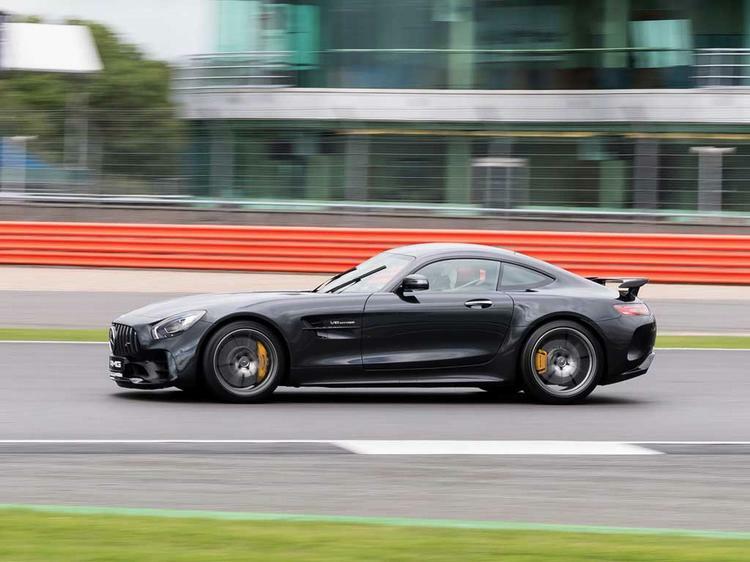 Driving it back to back with the SLS Black Series is interesting, given there's a lot of that car's structure (and spirit) underpinning the GT R. The SLS is hugely capable on track but in an old-fashioned manner, giving you a blank canvas on which to paint your driving style of choice. 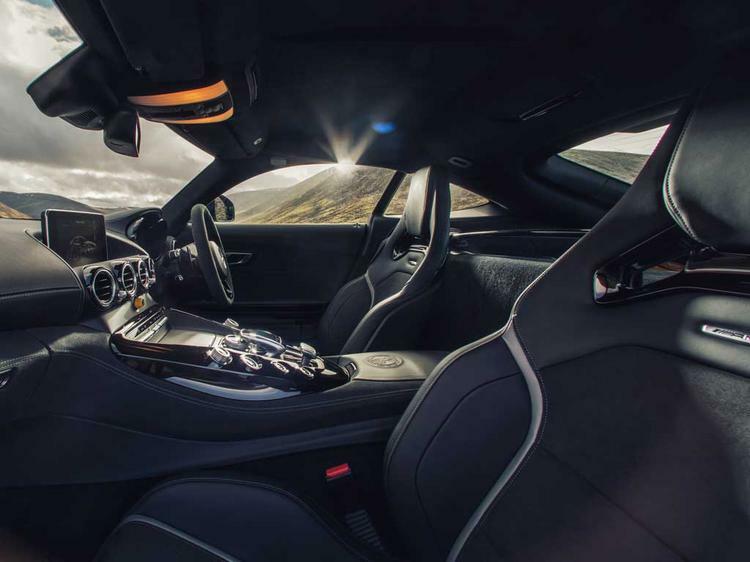 Technically, and in character, the GT R feels a huge step change on, though it's the four-wheel steering and aero-enhanced stability that stand out more than the switch from an atmospheric to turbocharged V8. Like all GTs the steering feels very light, the mechanical variable-ratio rack 'falling' into its lock rather than giving you some resistance to lean against. 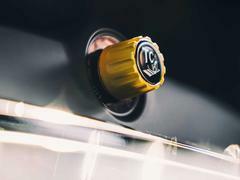 At lower speeds, when the wheels are turning in opposite directions, that makes it feel artificially darty; the changeover to the more stable and artificially stretched wheelbase mode ostensibly coming at around 60mph. It's a subtle sensation but there are moments where reaction to the wheel seems to be coming as much from the rear as it is the front. The GT and SLS benefit from the same inherent balance of having engine and gearbox within the wheelbase, both cars putting their V8s way behind the front axle and driving through a rear-mounted transmission, here running shorter, closer ratios from second to seventh. Traditionalists will prefer the transparency of the SLS's responses, but the R feels way, way more agile. And it doesn't take long to adapt to the more urgent turn-in accepting that, while the steering feels light, there's a load more front end grip than you'd initially credit. It's also brilliantly stable and composed both under braking and through rapid direction changes, areas where the SLS could get unsettled. There's compliance enough to be taking huge bites of kerb too, the R tied down but also able to swallow whatever you throw at it. And this sense of plantedness is what gives you confidence to lean on it harder and harder, Sport mode on the variable dampers tuned for the 'ring while Sport Plus is more locked down for flatter, smoother tracks. Because race car, right kids? After a couple of laps our chaperone is sufficiently reassured to permit the switch to Race mode, sharpening the R's edge still further. It's not like you suddenly notice the increase in grip, but the R's intent is clear - there's now even more front end at high speed and it'll get you into the corner quickly. Your job is to honour the deal and nail it out as fast as possible. Here the turbocharged grunt of the 4.0-litre V8 makes its presence felt. 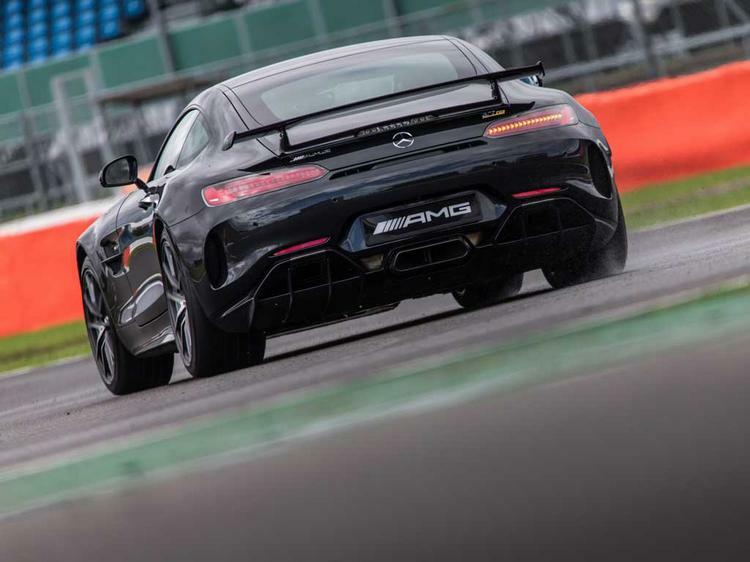 The SLS Black needs 5,500rpm before giving you its peak 468lb ft; the R's 516lb ft is there from 1,900rpm but, thankfully, it doesn't arrive in some destablising whump. 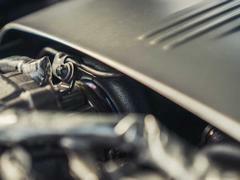 Even fresh from the SLS the response is very, very good for a turbocharged engine, goading you into earlier and earlier throttle from deep within the corner. And in the modern AMG way (E63's Drift Mode excepted) the active locking diff is all about corner exit traction rather than flamboyant oversteer. It would be lovely to try that variable traction control, to exploit holding it on the cusp of what the 12-inch wide Cup tyres can deliver, Race hinting at an exploitable shift into oversteer when you man up and get on the throttle early enough. One thing is clear though - you might not have a set as steely as Gebhardt's, but the GT R is ready and waiting if you do. This matters, AMG asserting its wish for the GT to do what its cars have always done in spectacular style. Just in the corners now, too. Not in green is a must. I'm not a fan of black cars, but this looks stunning. Much better than in green too! Sounds like a mega machine... They have one at the moment in the Mercedes dealer next door to the office, went for a nosey while ordering some parts and the thing looks absolutely incredible (it's in green as well). I'd have it in green too.